So here in NY the week before Christmas it was 60 degrees and this morning it was -15. Yep, you read that right. That’s a big ‘ole fat negative sign. I’m clearly not going anywhere so I’m definitely looking for some comfort food. Let’s be honest though. Just because I’m home, doesn’t mean that I’m not getting pulled in eighteen different directions by my girls. In order to keep my sanity, I need some Easy Dinner Ideas and luckily there were some amazing ones shared at Whimsy Wednesdays! 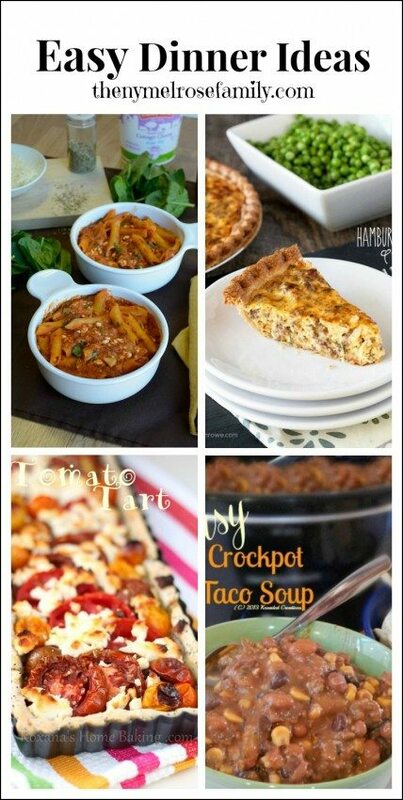 Love all the easy dinner ideas!! Thanks so much for including my slow cooker chili in the line up! I’ve printed off a few of the others to try! I too love all these ideas! Thanks for sharing! By the way, it was one of the coldest morning ever in Arkansas at 0 degrees and our pipes froze upstairs. Thank you so much for featuring my Slow cooker honey Parmesan pork roast! What a tasty roundup!